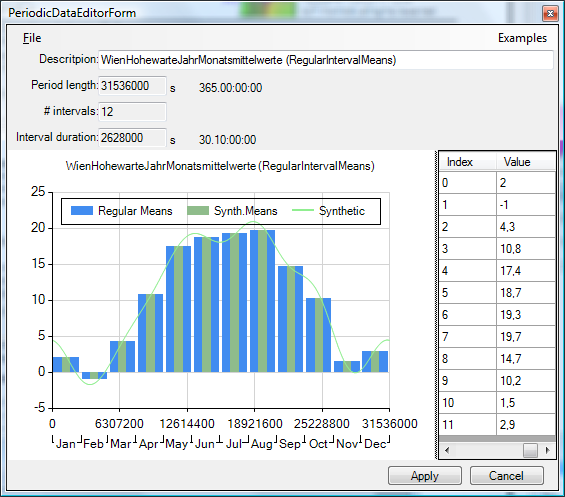 The Periodic / Harmonic Data Editor window provides the means of creating, editing and managing periodic climate data required as boundary conditions to transient evaluation. TRANSIENT-option: Solving and evaluating time dependant dynamic, periodic problems when heat capacity effects are concerned is only possible with an active TRANSIENT-Option of the program. The Periodic / Harmonic Data Editor will be used out of the Boundary Conditions window when transient problem is to be evaluated and time dependant boundary conditions are needed for that purpose. For convenient managing periodic data sets it us available from a Tools Menu also. New - create new data set of the specific part. A dialog is shown to provide the information required for specific type (see "Info Part"). Convert To... - allows simple synthetic conversions between selected periodic data types. Import... - allows import of climate data from the program Meteonorm. The Info part displays the characteristic information for the dataset being processed. Depending on the type of data different information is displayed and eventually available to input. The initial specific values are supplied during the creation of the data set (File->New...) and a limited set of them, depending on the data type processed, can be changed later. The graph chart represents and displays the input data along with its synthetic variant resulting from harmonic Fourier analysis and synthesis. Zoom with lasso is possible by clicking in the graph with the left mouse button and dragging the cursor to another position. With the right mouse button it is possible to reset the zoom. The legend provides the identification of patterns shown. A double click on to the legend will change its position relative to the chart area (right, left, top, bottom). Data points can be selected. Data points (or bars) can be dragged changing the value (press ESC to abort the unintentional drag operation an revert to the previous value). MULTICORE-option: Speeding up computationally intensive jobs by distributing them on multiple processors or processor cores for parallel execution is only possible with an active MULTICORE-Option of the program. (Gibbs Effect) Selection of the windowing filter function to reduce the Gibbs effect (e.g. while working with switch functions "IrregularIntervalSteps" or dense data with high value changes). Cut-Off Harmonic Limits the number of harmonics for the Fourier syntheis. The data is input into the Value column. The native Copy & Paste of the selected cell(s) is provided. Capability to paste data from/to the Value column streamlines the input procedure (also available via Context Menu). All numbers contained in the paste buffer (regardless if column(s) or row(s)) will be parsed as double entities (entries in error and not parse able as such in be ignored) and transferred in the order to the value column. With the button "Harmonics" the user can open a window where the individual components of the harmonic Fourier series are displayed in their temporal progression. The harmonic value at a given point of time is (approximately) the sum of the individual components. The user can choose which of up to twelve components should be displayed. It is also possible to assign various colours to the components. 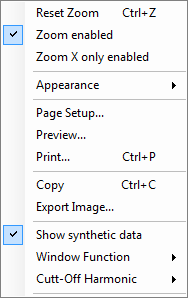 With the camera button it is possible to create a screenshot which can later be used in the report builder. In the Harmonics window there is this possibility as well.